A limited number of tickets are now available for Syracuse University students to attend the Everson Museum of Art‘s new exhibition “Turner to Cézanne: Masterpieces from the Davies Collection, National Museum Wales” free of charge. The tickets are being made available with support from the Chancellor’s Office and the Everson, in collaboration with SU’s Coalition of Museum and Art Centers (CMAC) and the Pulse Performing Arts Series. Free tickets will be available for SU students with valid I.D. at the Schine Student Center Box Office, (315) 443-4517. There is a limit of two tickets per student. Box office hours are Monday-Thursday, 11 a.m.-5 p.m., and Friday-Saturday, noon-9 p.m. The box office is closed on Sunday. The exhibition “Turner to Cézanne: Masterpieces from the Davies Collection, National Museum Wales” is drawn from an ex­traordinary group of 260 19 th- and early 20th-century paintings assembled largely between 1908 and 1923 by sisters Margaret and Gwendoline Davies. The exhibition speaks volumes about taste, patronage and philanthropy. The 53 works included present a survey of modern art, from Turner’s romantic naturalism to Cézanne’s modern aesthetic innovations. The exhibition is also a reminder of the value of creativity, and of persistence, as many of the artists were, at first, either misunderstood or scorned. 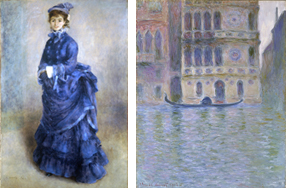 Painters once rejected, like the Impressionists, are now in the pantheon of the world’s most popular artists. Students attending the exhibition at the Everson are encouraged to ride Centro’s Connective Corridor Shuttle Bus. The shuttle stops at all marked Centro bus stops along the Connective Corridor and is free. For more information and to view the shuttle schedule, visit http://connectivecorridor.syr.edu/corridor-shuttle-bus. For more information on the free ticket offer, contact Pulse at pulse@syr.edu or 443-2718.